In the Netherlands there are many signed bicycle paths, local, regional and national. The so-called LF-routes (Long-Distance routes) are routes that cross the country from north to south, east to west, diagonally, along the rivers, along the zero Amsterdam Northsea level line etc. In Europe there are the long distance Euroroutes, Vélo routes etc, In many European countries there are dedicated cycle paths to serve the long distance pedal powered traveler. And the number is increasing! Good thing! Now South-Korea is, or may be, the first Asian country to have Long-Distance bicycle routes. Right now we are on a dedicated route along the east coast. 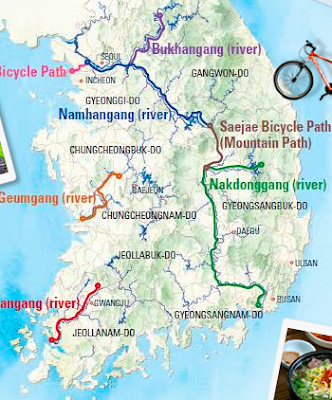 There is also the 4-rivers cycle path, that goes from Busan to Seoul, over 650 kms, and connects to several other along the river cycle paths. The path we are currently following is marked by blue and white signs and by white symbols and a blue line on the pavement. Sometimes it's just the road side where all the traffic is, very often there are separated path ways, sometimes even special boarded constructions. Well made!